Manhattan, NY According to Related Companies and Oxford Properties Group, developers of the $20 billion Hudson Yards redevelopment, 30 Hudson Yards has officially topped out. The final beam was placed on the steel crown on July 17th. The 1,296 ft. tall building is made up of more than 40,000 pieces of steel weighing 91,500 tons, 1.25 million bolts and enough welding to cover 196 miles. In addition to providing commercial office space for leading businesses, including Kohlberg, Kravis & Roberts (KKR); WarnerMedia and its subsidiaries CNN, HBO, Warner Bros. and Turner; and Wells Fargo Securities, the 2.6 million s/f LEED Gold-designed skyscraper by Kohn Pedersen Fox Associates will also feature panoramic views from the highest outdoor observation deck in the Western Hemisphere. Related Construction is the general contractor and Tishman Construction is the contractor for 30 Hudson. The Hudson Yards Observation Deck stands 1,100 ft. in the air and extends 65 ft. from the building. It is expected to open to the public in 2020. Adjacent to the deck, on the building’s 101st floor, renowned British hospitality group rhubarb will program a 10,000 s/f restaurant, bar and event space offering a one-of-a-kind dining experience. 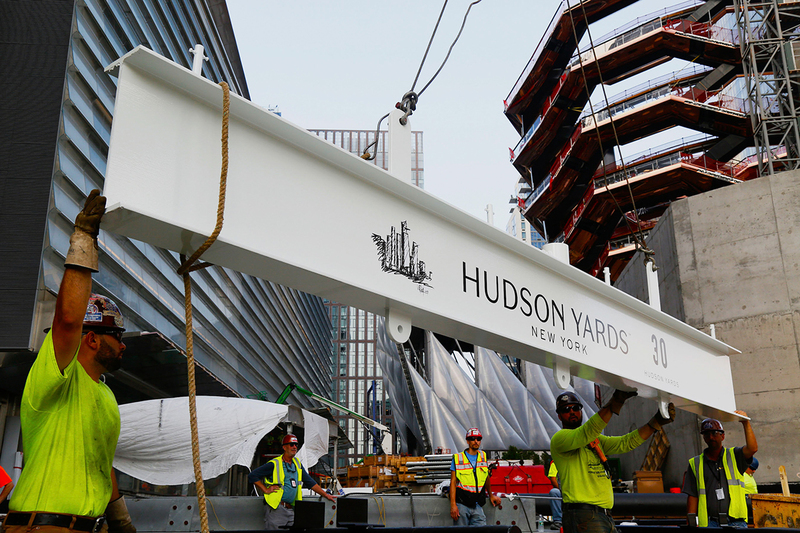 Hudson Yards is a new neighborhood bringing 18 million-plus s/f of mixed-use development to the West Side. The site includes 100 shops, including NYC’s first Neiman Marcus; signature restaurants and food experiences by chefs and restaurateurs Thomas Keller, José Andrés, David Chang, Michael Lomonaco, Costas Spiliadis, rhubarb and D&D London; new residences; 14-acres of public open space; a new 750-seat public school and an Equinox Hotel with 200 rooms.